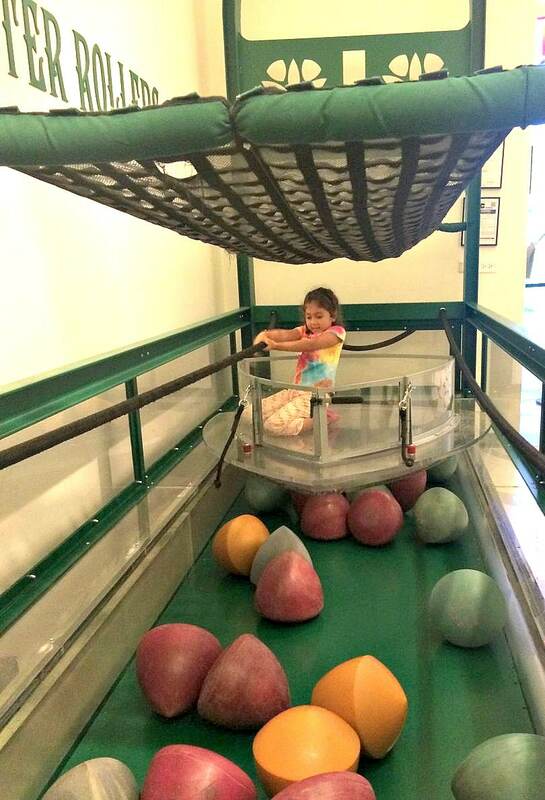 MoMath Museum is one of the most fun and educational New York City attractions you’ve never heard of. 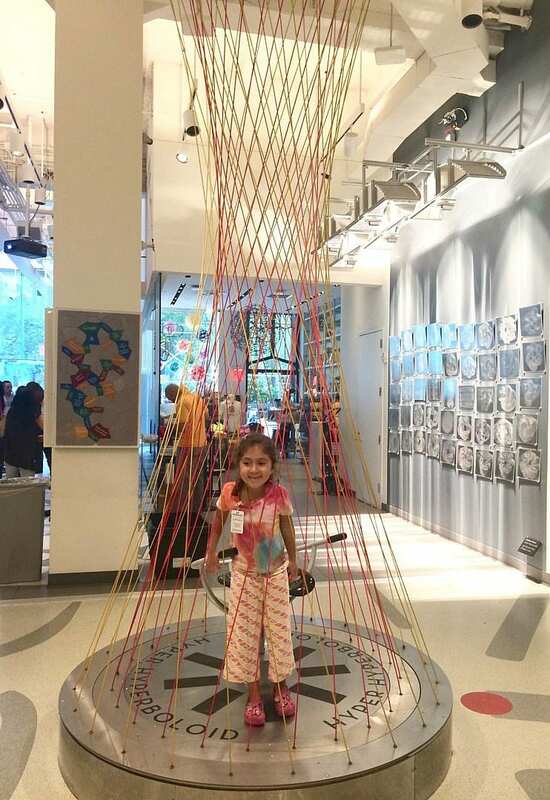 This one-of-a-kind museum features hands-on exhibits that teach kids about STEM (science, technology, engineering and math) in the most entertaining ways. As a mom and New Yorker, I love its manageable size, interesting exhibits, and friendly staff members. Plus, it’s open 364 days a year. 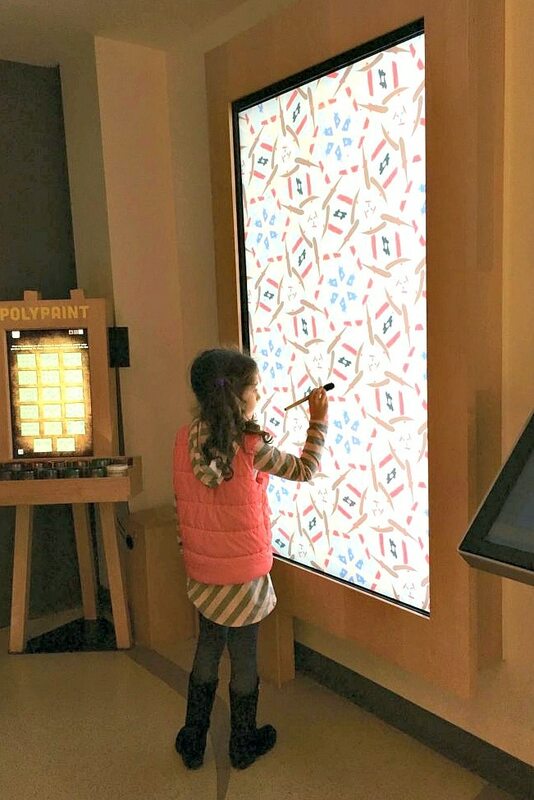 If you’re planning a visit to NYC, check out these 11 ways the National Museum of Mathematics make math fun for kids. 2. Sitting in chairs that wobble but don’t tip over. 4. Painting on digital canvas. 5. Watching shapes that rock and roll. 6. Swiveling in the middle of a quadratic equation. 7. Creating glowing footsteps on a light-up floor. 8. Meeting a swarm of robots. 9. Riding a Coaster Roller. 11. Bringing a love of math home. 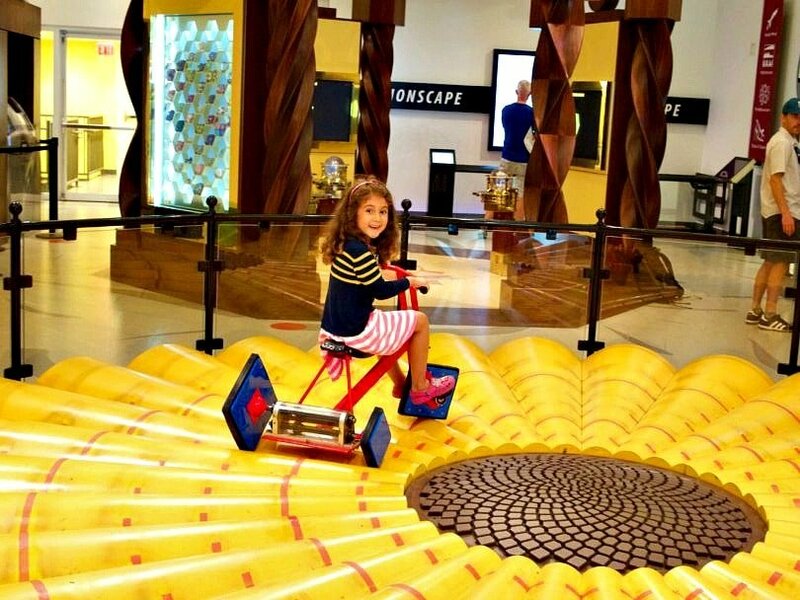 A must for kids and grown-ups alike, this exhibit features large and small square-wheeled trikes taking center stage on the main floor atop a grooved circular base. Will it feel bumpy or smooth? Come find out. The sculpted Magis Spun Chairs have a pointed bottom, which lets guests rock side-to-side or spin completely around and around. Because of the design, you will stay safely put even though your body may feel differently. At the Human Tree exhibit at MoMath Museum, watch carefully as your body appears on a large screen as a tree made out of smaller and smaller body images. As you move, so does the tree creating, some entertaining designs. This is big hit with small kids. For artsy kids, the Polypaint exhibit is a must. Using a special brush, kids can “paint” on a digital canvas, while making symmetrical patterns in the design. This popular attraction is hidden away towards the back of the first floor so be sure not to miss it. The Twist ‘n’ Roll table features several differently shaped “balls” that roll in distinct patterns. Guess which shapes will follow the various lines in the table and how each form will roll. This MoMath Museum exhibit is described by the Observer as, “The Hyper Hyperboloid, a spinning swivel chair surrounded by a circle of floor-to-ceiling ropes, which, when turned, allows you to construct and surround yourself in the elegant contours of a quadratic equation. It’s more fun than it may sound.” As guests spin in the the chair, its truly amazing to see the lines start to curve as the base spins. Kids will love playing on the Math Square, a gigantic light-up-floor. They can follow the glowing steps with their feet to create patterns and play games. This is a great option for young children. According to the MoMath website, Robot Swarm allows you to, “Interact with two dozen small, glowing robots who react to your presence and communicate with each other, chasing after you or zooming away as you move across the floor. With cutting-edge new developments in motion control and positioning systems, this is the most ambitious robotics exhibit in the nation.” When kids put on the special vests in this exhibit area, they can interact with glowing robots that react to them based on mathematical rules. This one may take kids a bit of time to figure out but once they learn to play, they won’t want to leave. Kids will love using their body weight to pull themselves in their “coaster” over a sea of unusually shaped oversized acorns. The constant diameter of the acorns assures smooth sailing. Take a break and sit at one of the small tables at this exhibit as you test your skills at different mathematical puzzles, quizzes and games. There are activities for all levels, making this a great meeting spot if you’re traveling with a big group. Most museum gift shops are pretty ordinary but the MoMath gift shop features some really unique gifts so don’t miss it. Choose from a wide range of educational toys for kids of all ages. Mom and dad will appreciate unique home goods (Pizza Pi Cutter! ), books, jewelry, artwork and much more. Kids don’t have to love math to appreciate the MoMath Museum. I’ll bet, however, that your whole family leaves with a better appreciation of why math really is important…and fun! 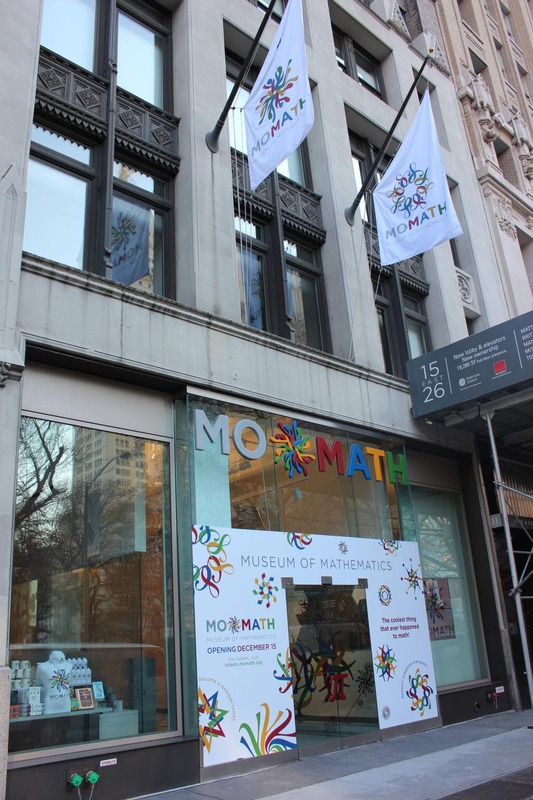 Would you like to visit MoMath Museum with kids? Let us know know in the comments below! A Note from The Globetrotting Travel Mama: I did not receive any comps or media discounts related to this story. All opinions are mine, as always. This is awesome!! My kiddo is math obsessed and has been asking to go here for a while. Guess we’ll be adding this to our summer bucket list! Think he’ll get a real kick out of that square-wheeled tricycle ???? Such a fun spot. I’m sure your son will love the tricycle and all the exhibits. Would love to visit! We are celebrating my daughter’s 11th birthday and first trip in NYC arriving 4/20/- 24.